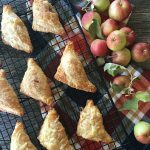 Make these Easy Apple Turnovers with Cheese as a simple and delicious dessert or snack! Use a pre-made puff pastry for extra ease. In a sauce pan over low/medium heat, add the chopped apples, sugar, cinnamon, cornstarch and water. Stir and cook until the apples are soft and the mixture is thickened. Once thickened, remove from heat and set aside. On a lightly floured surface, roll out your pastry sheets. Cut each sheet into 6 even squares. Spoon out 2 tsp of the apple mixture into the centres of the pastry squares. Then fold the dough over making them into triangles. Press the edges of each pastry with a fork to seal them. Brush the sealed pastries with the milk, then generously sprinkle with cinnamon and sugar. Then sprinkle on the shredded cheese (as shown above). Bake them on an ungreased cookie sheet for about 12 – 15 minutes. Make sure to watch them to make sure they don’t burn. The pastries should be golden brown when done.